Asia's largest international food and hospitality trade event. 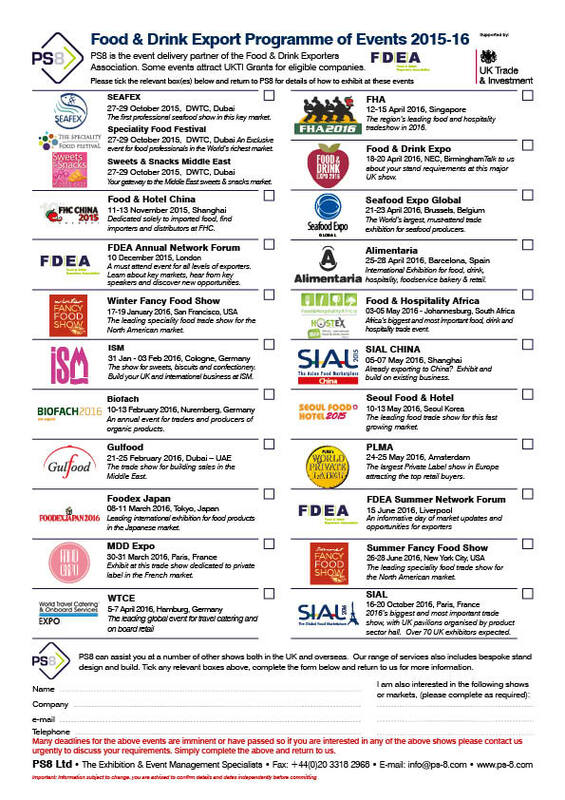 Now in its 21st edition since its debut in 1978, FHA (Food&HotelAsia) has always been the premier sourcing platform for thousands of food and hospitality trade buyers in Asia. With a spectacular showcase of the latest products, services and technologies from market leaders, FHA addresses the procurement needs of trade buyers and provides an abundance of networking opportunities for Asia's food and hospitality industries. In 2016, an outstanding 47,630 trade buyers visited FHA which was an 8% increase on the previous edition. 41.9% of visitors came from outside Singapore. Take a stand and benefit from the full package of PS8 support. Work with us to make your space stand out through a range of design, furniture and display options. The 2016 UK group included stands from EBLEX (English Beef & Lamb Executive) and a pavilion from Scotland. Store visits and an evening reception added value to the participation of the UK exhibitors. Register your interest on the Apply Now button.